Bob’s Polytape Printer’s, a company separate from Kraftape Printer’s but operating under the same family ownership, offers Printed Pressure Sensitive Tapes ( PST ) for your packaging and carton sealing needs. 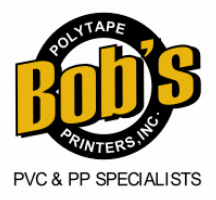 Bob’s Polytape Printers has been offering custom printed PST in the New Jersey / New York area since 1994. Printed Pressure Sensitive Tapes are available in BOPP Hot Melt, Cold Temperature, Acrylic, and PVC (natural rubber) at various printed roll lengths and tape thicknesses. With a comprehensive list to choose from, Bob’s Polytape Printers, Inc. has the right tape for any carton sealing condition. Most common and continuously in-stock surface printable tape colors are White, Tan and Clear (WTC). Special order colored tapes are available as well.